The Zodiac was first published in 1893. Digital, full-text searchable editions of select Emory yearbooks, the Zodiac (1893-1901) and Campus (1911-1962) are available online. "Two distinct threads, one digital and one historical, are inextricably interwoven in this project which brings together over a century of Emory yearbooks in one place with free, online access," says Ginger Cain Smith, interim director of MARBL. Visit MARBL's dedicated digital yearbook archive for free, online access to the yearbooks by selecting a PDF. Also featured here is the 2011 Emory yearbook, which students revived as an online digital publication after the last yearbook was published in 1999. "Staff from throughout the Emory Libraries collaborated to create this enduring resource as a 175th anniversary gift to students, faculty, staff, alumni and friends of Emory," says Smith. 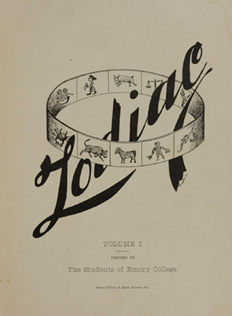 In 1893, students at Emory College founded the school's first yearbook, the Zodiac. Later known as Campus, the yearbook provided a chronicle of student academic and social life on the Emory campus from the late 19th to the turn of the 21st century. For more than 100 years, the Emory yearbook captured on paper the spirit, scholarship and fellowship of the Emory campus. Already a heavily used resource in the Manuscript, Archives, and Rare Book Library, these volumes will now be accessible beyond the grounds of the Emory campus. As part of the Woodruff Library's commitment to digital initiatives and the University's celebration of its 175th anniversary, MARBL is digitizing the entire run of the Emory yearbook, creating a vibrant and full-text searchable archive of the University's beloved student publication. While not the first major student publication on campus (that honor belongs to the Emory Mirror), the Zodiac nevertheless represents a significant moment in the history of student publications at Emory. The introduction to the first edition of the Zodiac notes that while students long had wanted an annual, not until 1893 had their "means jumped with [their] desires" and enabled them to afford such a publication. The date of the first Emory annual coincides with a period in which printing technology in the United States was increasingly affordable and print advertising was on the rise, thus enabling a variety of new publications, including college and university yearbooks. Indeed, like its future counterparts, the first Emory yearbook was funded in part through advertisements by local businesses, such as the Coca-Cola Company. From their inception, Emory yearbooks highlighted student social clubs and societies by publishing membership rosters, photographs, organizational histories, songs, cheers and chants. The first edition of the Zodiac featured the school's fraternities, as well as the Ugly Men's League, Emory Glee Club, Phi Gamma Literary Society, Few Society, Emory Phoenix, Sub-Fresh orchestra, and athletics teams along with information on the different classes and Emory students. Each class included its own "history" and class chant or song, along with a listing of students' names and hometowns. One notable addition in the first yearbook is the inclusion of two Asian students; one was sophomore K. T. Tsoong from Shanghai, China, and the other graduating senior Yun Ch'i-Ho from "Corea," whose personal papers are part of MARBL's collections. A popular yearbook feature begun in the mid-1920s was a section devoted to "Southern Beauties," which highlighted some of the students' favorite female companions and fellow students. In the 1950s, this section was devoted to the Emory University "Queen" and her "Court," but still included stylized portraits of female students. By the 1970s, however, the tradition of including the "Queen" or "Miss Emory" in the pages of Campus had ceased and the 1972 winner, male student Ira Luft, was not included in that year's annual. 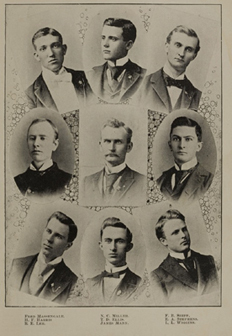 Other common elements found in all the yearbooks were whimsical illustrations and photographs of special events and occasions, classes, fraternities (and later sororities), sports, and members of the faculty and administration. The cultural and political issues of the day also appeared in the pages of the Zodiac and Campus. Yearbooks from the 1940s feature students mobilizing for World War II, while those from the 1960s reflect the decade's radicalism and concerns about the war in Vietnam. Robert W. Woodruff's generous 1979 gift of $105 million from the Emily and Ernest Woodruff Foundation to the University was featured in the pages of Campus, along with the lyrics to a song proclaiming Emory as the Coca-Cola school. The Campus editions from the 1980s and 1990s highlight an increasingly diverse Emory University student body and community engaged in transformative research, scholarship and social action. Throughout their history, the Zodiac and Campus provided valuable glimpses into student life at Emory. In 1945, however, when a large part of Emory's male student body was engaged in military service, the yearbook ceased publication. There is also a gap in the series in 1979 when Emory students failed to produce an annual. Whereas the publication of the first Emory yearbook in 1893 heralded a new era of print technology, the final edition of Campus published in 1999 in many ways signaled the end of the dominance of print and the rise of digital media. Today's Emory students still celebrate the University and its unique student culture, of course, but documentation of these events and milestones now is more often recorded on the pages of Facebook, in YouTube videos, and through Twitter feeds. By digitizing the Emory yearbooks and making them available online, MARBL is providing access to these delightful volumes beyond the campus grounds, while helping to ensure that the spirit of Emory lives on in the digital age. Kate Donovan Jarvis is University Archivist. This article originally appeared in the spring 2011 edition of MARBL Magazine.